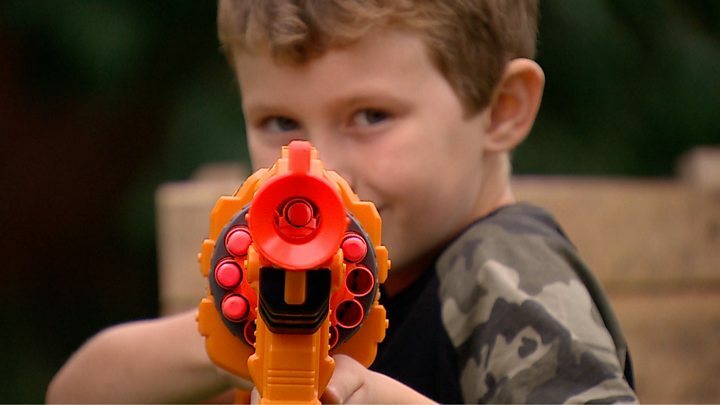 The mother of a boy whose Nerf gun party sparked calls to the police said the officers who came made his day. Norfolk Police found Oliver Green and his friends having the time of their lives celebrating his eighth birthday in Yaxham, near Dereham. Oliver said: "I put my hands up and dropped my gun. I thought I was being arrested but it was a great party." Children screaming and firecrackers sounding like gunfire caused a worried neighbour to dial 999. Norfolk Constabulary confirmed three officers had to respond because it was a report of gunfire that might not have been connected with the party. When they realised there had been an innocent mistake, they stayed to pose for pictures with the birthday boy and his friends. Oliver's mum Lisa Green said the police were "really good sports" and "made Ollie's day". "They asked who the birthday boy was and asked Ollie lots of questions after he put down his gun. "They also wished him happy birthday. That really made his day." Oliver said: "It was a great party and all my friends had fun, but my parents spent a lot of money." A neighbour who did not want to be named said: "We were gardening and we thought it was an explosion in a house. "We stopped and thought what the hell was that! But we laughed as we realised it was a children's party." On 5 August police had responded to reports of gunfire in Yaxham during a battle re-enactment at the village rail station.